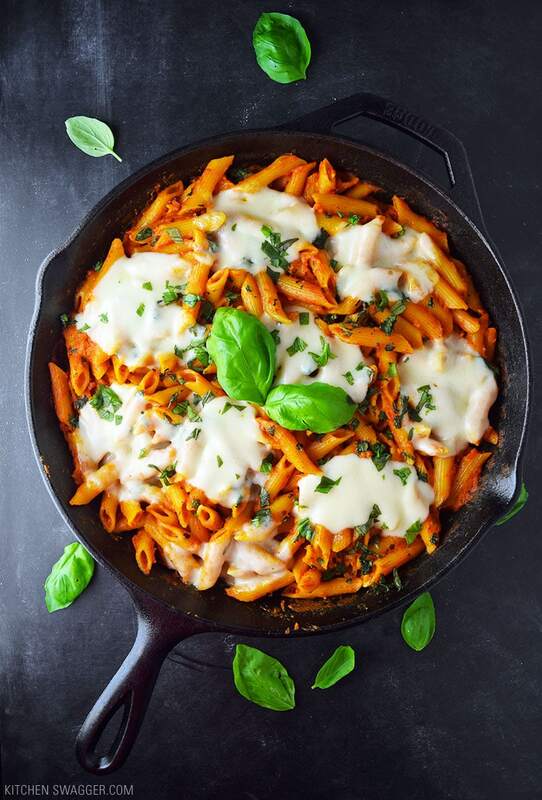 Super easy, hearty and delicious no-boil baked penne recipe topped with fresh sliced mozzarella and chopped basil. I set out to cook an easy baked pasta dish in a single cast iron skillet and after some research and experimentation, I’ve come to a single conclusion. No-boil baked penne is the greatest kitchen hack ever created. 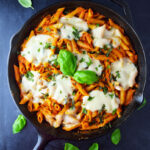 Introducing baked penne with chicken and mozzarella cheese. YES. All you need is one cast iron skillet and some tin foil. The hack is ‘boiling’ the pasta right within the pasta sauce while baking in the oven. No pre-boiling required. I’m REALLY fired up about this recipe because it’s incredibly easy to make and WICKED GOOD. Can you tell? I was a major skeptic of this method at first. I thought at best the penne might be slightly chewy around the corners or dried out but nope—it was perfectly al dente. You could never tell the difference. This recipe cuts out about 25 minutes of heating up, boiling, straining, and cleaning pots and pans. No fun, not for me. 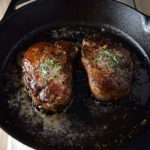 I highly recommend you get a cast iron skillet, it makes this recipe a cinch. 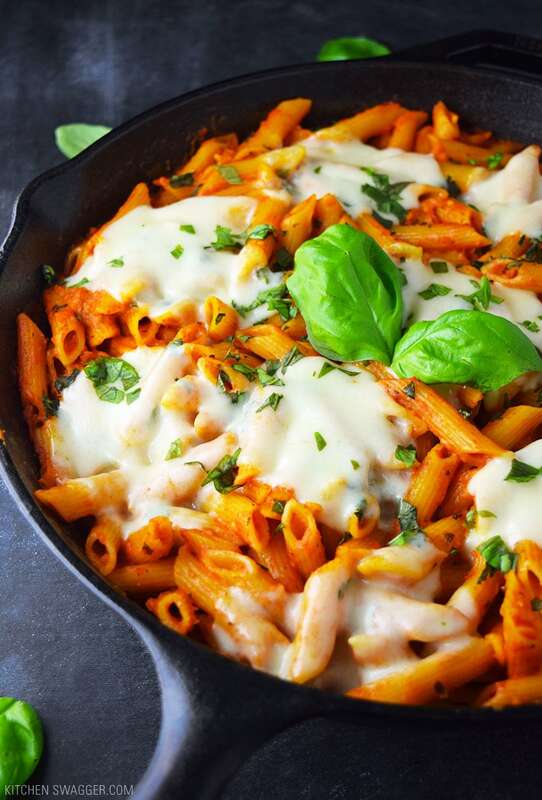 The sauce is slightly thick and sticks to the penne, just like your favorite baked pasta recipe. 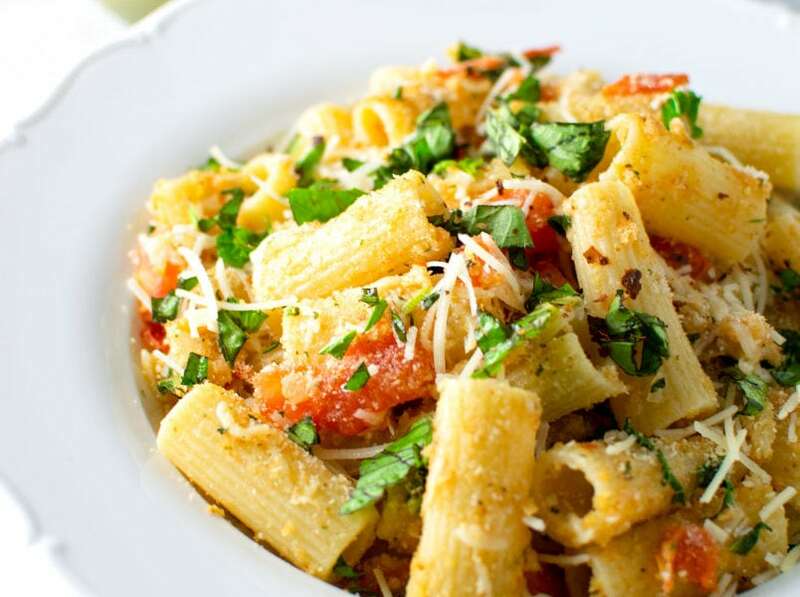 The trick to no-boil, baked penne is adding 2 cups of water to the sauce before baking. The penne will soak up the water (and all the flavors) and fully cook, leaving you with a sauce that has the perfect consistency. 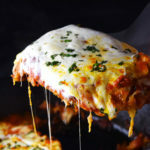 The parmesan and mozzarella cheese transform this dish to a cheesy gooey sensation. It’s absolutely delicious and hassle free. A perfect hearty weeknight dinner. 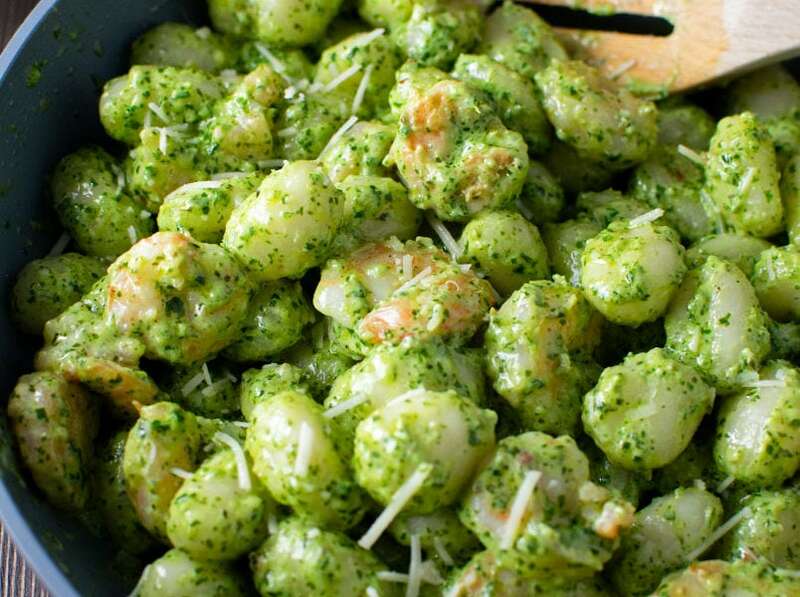 Can you ever go wrong with lots of garlic and fresh basil? 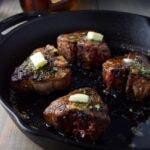 In a cast iron skillet on medium heat, combine olive oil and garlic. Sauté for 1 minute. Add the sliced chicken and sauté until fully cooked through, about 6-7 minutes. Add all remaining ingredients except for the uncooked penne, mozzarella, and basil. Stir until mixed and let heat up, about 2-3 minutes (the sauce will be watery at this point). 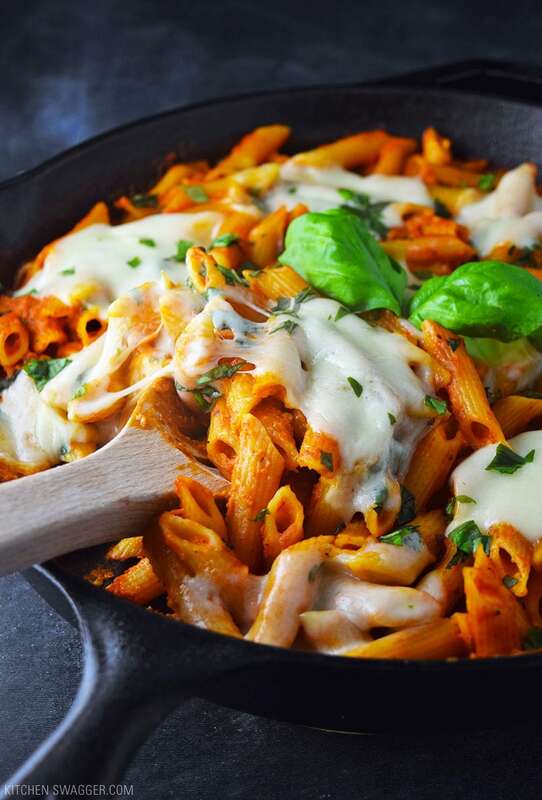 Stir in uncooked penne and evenly distribute throughout the cast iron skillet, making sure penne is fully submerged beneath the sauce. 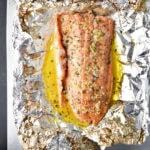 Cover tightly with tin foil and immediately transfer to the oven. Bake covered for 30 minutes. Remove from the oven, remove foil and top with mozzarella slices and fresh basil. Bake for 10 more minutes uncovered or until mozzarella cheese is fully melted. Let cool and serve. 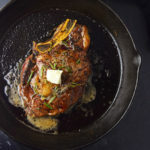 As a chicken variation, you can sauté sliced chicken in the skillet and fully cook before proceeding with the regular recipe. Oh my. . .can I tell you that I just returned from Italy and this beauty is bringing back so many memories of the delicious pasta dishes I indulged in? Probably the best meal I had was a homemade Caprese ravioli on the island of Capri. This dish reminds me of an easy, weekday version of that. P.S. loving this kitchen hack and will definitely need to give it a try on those days that an impromptu pasta craving strikes. Thanks Lynn! That’s quite the compliment – glad I could help bring back what sounds like delicious memories. You must try the pasta hack! Thanks Dean! Glad everyone liked it. I made this for a last minute potluck, and t was a hit! I loved it so much I am making it again for my family tonight. I like meat in my pasta, so I browned 1 lb of hamburg with the onion and garlic. I and added the rest of the ngredients as irected ND it came out perfect! I did cook it in the Dutch oven. The skillet would have probably been too small. Hi Karie – YES! great idea. I thought of that as well. Dutch oven same idea, maybe even easier ;). I personally want to try this with chicken or shrimp too. By “pasta sauce”, any particular type or flavor? Made this tonight for dinner!!!! It was fantastic, it is now my favorite pasta. Now keep in mind I didn’t add the chicken as I am not to found of it in pasta, and I used heavy whipping cream as that is all I had on hand, but still turned out to be best pasta recipe ever!! Family loved it!!! Thanks for a great great recipe!!! So very much flavor and easy easy!!! Thanks Vanessa – this is one of my absolute favs personally ???????? So simple and absolutely delicious! Will make again.